WE ARE STILL WORKING ON THE ROOMING ARRANGEMENTS! a) ... all people who asked for a single room will be at Hotel MANI. b) ... those who share a room will either be at Arcotel VELVET, or AMANO. We will let you know as soon as possible! You will need to check with your telephone provider to see if you have the ability to use your phone and if you can send text messages while abroad. Most Americans don’t sign up for this service and only find out once they are in Europe. So please check. In any case, sending texts (SMS) can be costly. Making phone calls is insanely expensive. That’s because of roaming charges. In fact, make sure you set your smart phone so that the data roaming is turned off. If you have a smart phone, we suggest downloading both What’s App and Viber. The former lets you send texts when there’s an internet connection. Viber allows you to call via internet when there’s a connection, and for free. Viber, however, will also use 3G networks, and that means data roaming. Please note: When you look for the address "Auguststraße 43" (i.e. the address of Hotel Amano) on google maps, it does NOT show the correct location. Trust this map instead! The good news is: there are only two times you will be left to your own devices--getting from the airport in Berlin to the hotels and back to the airport at the end of CSA. In between, we will take care of all your logistics. Once you’re in our hands, all you have to do is show up. Hotel AMANO is 200 meters from the Rosenthaler Platz U-Bahn (subway) station. The Hackescher Markt S-Bahn (city rail) station is an eight-minute walk away. Hotel MANI is 140 meters from the Rosenthaler Platz U-Bahn station. The Hackescher Markt S-Bahn station as well as the Berlin Nordbahnhof S-Bahn station are a 10-minute walk away. Hotel Arcotel VELVET is 180 meters from the Oranienburger Tor U-Bahn station. The Oranienburger Straße S-Bahn station is a four-minute walk away. The good news is it’s not terribly expensive from the Tegel airport to the hotels by taxi, especially if you are sharing with one or two other people. A taxi costs around €25 and will take 20 to 25 minutes. Going by public transport to MANI and AMANO: The easiest way: take the Bus 128 to its final destination Osloer Straße. From there, you take the U8, direction Hermannstraße, and you get out at Rosenthaler Platz. From there, it’s easy to find the hotels (see map). According to the Berlin Transport Company (BVG; http://www.bvg.de/index.php/en/index.html) this trip costs €2,40 and will take around 35min. Going by public transport to Arcotel VELVET: The easiest way: take the Bus 128 to Kurt-Schumacher-Platz. From there, you take the U6, direction S+U Friedrichstr. Bhf, and you get out at Oranienburger Tor. From there, it’s easy to find the hotel (see map). According to the Berlin Transport Company (BVG; http://www.bvg.de/index.php/en/index.html) this trip costs €2,40 and will take around 30min. The good news is: there are only two times you will be left to your own devices--getting from the airport in Berlin to the hotels and back to the airport at the end of CSA. In between, we will take good care of all your logistics. Once you’re in our hands, all you have to do is show up. To get from the Schönefeld airport to the hotels is not very tricky but it takes a while, no matter how you travel. A taxi will take a good 40-45 minutes and will cost around €35 or more. Alternatively, you go to the regional Berlin Schönefeld train station (city rail), go up to one of the automated ticket kiosks, choose English on the menu screen and buy your ticket. To get to all three hotels, you take the RE7 or the RB14, regional trains, direction Dessau, Hauptbahnhof. The train takes less than a half and hour. For MANI and AMANO: leave the RE7 or RB14 traion at Alexanderplatz Bhf. From there, you take the U-Bahn, namely the U8 direction Wittenau, and get out at Rosenthaler Platz. From there, it’s easy to find the hotels (see map). According to the Berlin Transport Company (BVG; http://www.bvg.de/index.php/en/index.html) this trip costs €3,10 and will take you about 45min-1h, depending on waiting times. For Arcotel VELVET: leave the RE7 or RB14 traion at Friedrichstr. Bhf. From there, you take the U-Bahn, namely the U6 direction Alt-Tegel, and get out at Oranienburger Tor. From there, it’s easy to find the hotel (see map). According to the Berlin Transport Company (BVG; http://www.bvg.de/index.php/en/index.html) this trip costs €3,10 and will take you about 40min-1h, depending on waiting times. Young Anglos and others love to share their favorite haunts in Berlin. Here are some good ones that will guide you to some cool places. I heart Berlin is up to the minute and very hip. Rory McLean is a Canadian-born, London/Berlin writer who has written some remarkable books, most notably, Stalin’s Nose. This is his irreverent take on Berlin. Here is The Guardian’s City Guide to Berlin. Very useful! 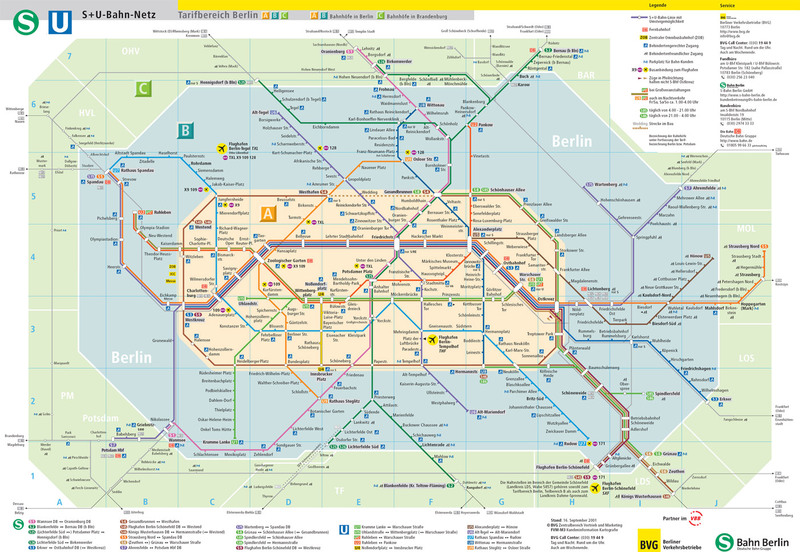 Click here to find an U-Bahn / S-Bahn map! Click here to go to the English "Trip Planner" of the Berlin public transport company.